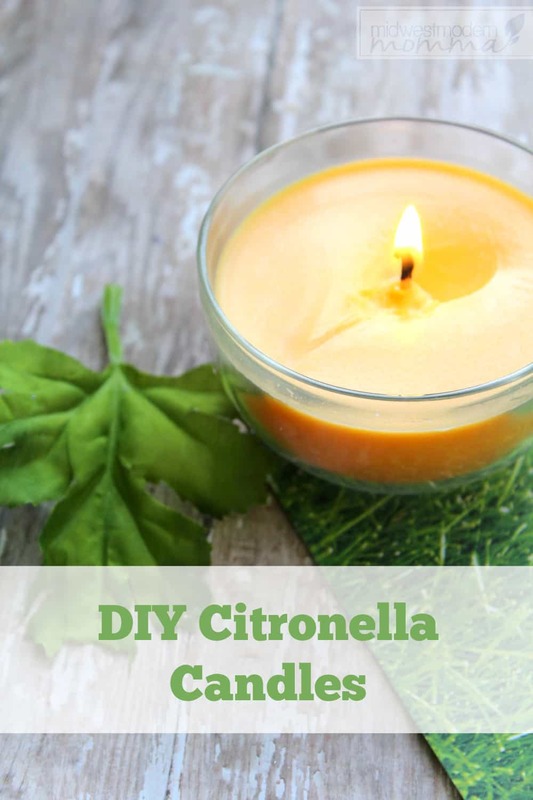 If you plan to do any outdoor picnics, fun days playing in the yard, or camping this summer, our DIY Citronella Candles with Essential Oils are going to become a life saver! This easy to follow tutorial makes them a great choice for a fun afternoon project that is also useful. A fun day spent outdoors quickly becomes unpleasant when you are being attacked by mosquitos and no-see-ums! 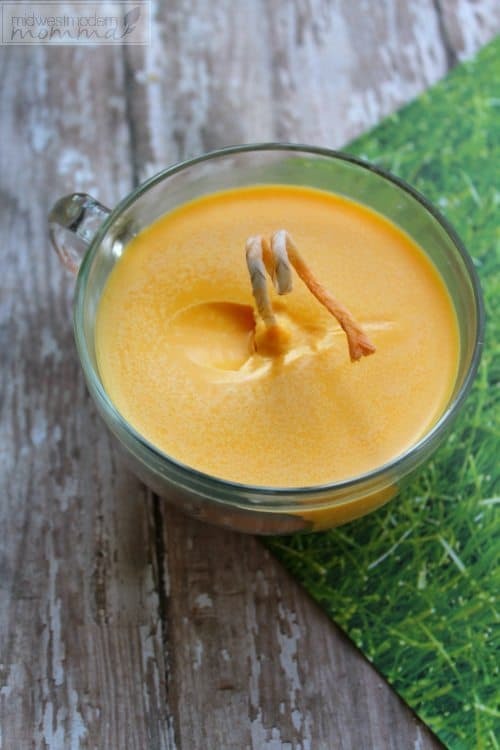 Whip up a few of these Citronella candles for a fun day without the pesky bugs! 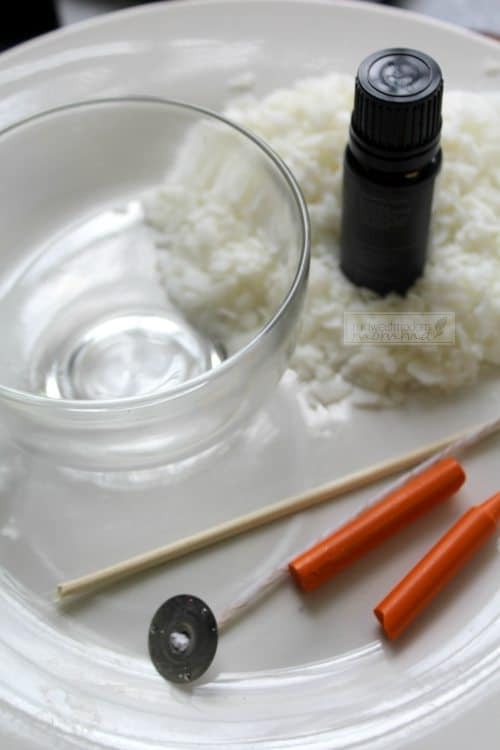 Don't forget to check out 100+ ways to use essential oils around the house while you are here! This post contains affiliate links. This means that if you click a link and then make a purchase, I may make a small commission to help keep this site up & running, bringing you more DIY and healthy living ideas! Plus coffee. Always coffee. When the weather starts getting warmer outside, the bugs and insects appear. If you prefer to use more natural products, this can mean testing out different brands of bug spray to see which actually work (pretty sure two that I tried this spring were actually attractants but man did they smell so good!) and trying not to kill your budget with the expensive price tags that seem to come with anything that isn't bad for you. One mosquito can wreak havoc on an otherwise fun day at the park, especially if you are like me & welt up like crazy! Using our citronella candles with essential oils is an excellent method of keeping them at bay when you are stationary. If you are out and about, I highly recommend this Bug Repellant Spray I found at our local Hy-Vee. I found a similar one on Amazon, if you don't have Hy-Vee in your area and want to try it out. It's been a life saver so far this summer with all the time at the park with the boys and now lives in my purse so I can't accidentally lose it (because I would cry without it). 1. In a nonstick pot heat the 2 cups of soy flakes on a medium heat. Stir as you heat to prevent sticking and encourage even melting. 2. Add 10-15 drops of the citronella essential oil. If you wish for a stronger scent you can add more. 3. Optional: prepare to color your wax. If you wish to leave it white you may. If not, DO NOT use food coloring to tint the wax. Use a crayon in your choice of color. Just unwrap, break the crayon into pieces, then drop it in and stir gently until it melts. 4. Prepare the wick. 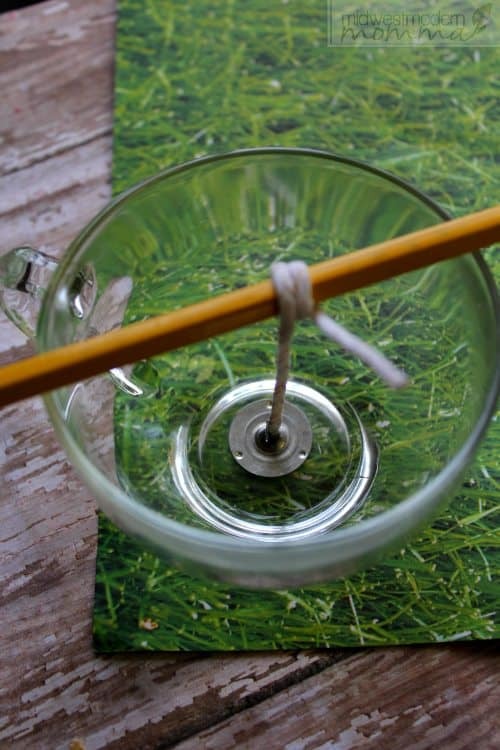 Wrap the top of the wick around a pencil or stick and let it sit across the top of the jar or container of choice. Let the weighted end of the wick drop to the bottom of your container and rest. 5. Slowly pour the melted wax into the jar. Keep the wick as centered and adjust as needed. 7. Allow for several hours for the wax to set. Do not disturb it. 8. Once the candle has hardened (may take up to 4 hours) snip the wick down. 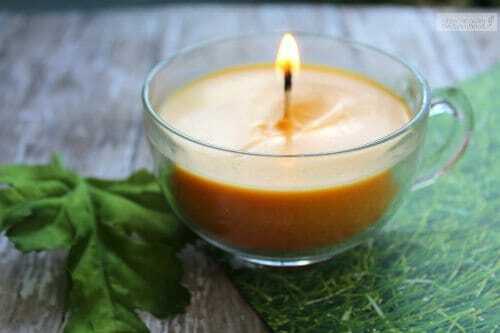 You can now light and enjoy your citronella essential oil candle. As you can see, these are fairly easy to make on your own. Citronella candles are a great addition to your camping kit for the summer. You can also make them have on your porch for those nice cool summer evenings you want to sit outside while the kids play. Having something on hand that helps repel insects is a must. Nobody likes having itching wounds, and this helps tremendously toward prevention. 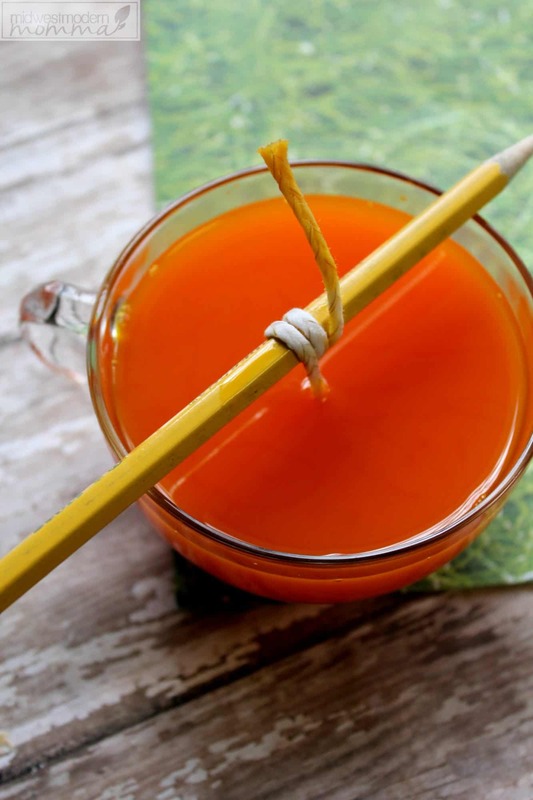 Make sure you keep the hot liquid and glass away from children when creating these DIY citronella candles with essential oils. Older kids may help with the process, but you want to be careful so nobody drops a glass jar or pours hot wax on their hands or body. Making these using citronella essential oils is a great easy way to create a multi-purpose soy wax candle this summer. I defiantly have candles on my to-do list. What do you think has the longest lasting scent? I love my wax melts but they don’t seem to last more the 6hurs or so. I didn’t know you could use essential oils to make these. The candles look easy to make and perfect summer time to keep the bugs away. Thanks so much for sharing with us at #overthemoon link party. I’ve shared on social media. Have a great week and see you next week. Love your DIY. Thanks for sharing at the #InspirationSpotlight party @DearCreatives Pinned & sharing. Have a happy 4th of July. I love the smell of citronella candles! coming up with some of the best stuff. I shared this with my followers on facebook and my followers gave great feedback!